On THURSDAY, JUNE 15, 2017, 6 PM - 9 PM the Brewers & Blues tour will be in San Clemente, CA at Left Coast Brewing. This is the second time we have been to this awesome brewery and tap room, it's fun group regulars. It's going to be a great place for a blues jam. 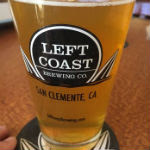 Left Coast Brewing Company is family owned and operated in the iconic surfside town of San Clemente, California. Left Coast prides itself on its commitment to quality and constantly strives to find premium ingredients to achieve the perfect balance of aroma and flavor. The family and brewers that comprise Left Coast are passionate about the art and craft of brewing and seek to invent recipes that they not only love drinking but love sharing. Ingredients, technique, and passion poured into every pint, that is the Left Coast way.